Stewardess! went through two iterations at Herstory Theatre's annual "Raw Stages" festival, both of which I saw and loved, although the readings were a bit talky and pedantic. 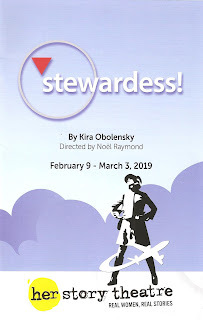 Playwright Kira Obolensky has solved that issue, as I had no doubt she would, and managed to get in all the important facts while telling the story in a playful and engaging way. The set-up is that we're all on a flight through history, a sort of fantasy flight that also includes feminist icon Gloria Steinem and Lorraine Wright, who fought a similar fight in the airlines for racial equality. The play begins and ends at an airport with the usual scurry, while our characters all get on the flight and take us along with them. Mary Pat is sometimes addressed by a voice (her conscience? her inspiration? ), and scene transitions are often accompanied by this small intrepid cast singing period songs about flying, which adds levity to what could be a heavy story. It's all quite delightful, and incredibly inspiring (especially if you attend with an audience full of current and former flight attendants, as I did, for whom Mary Pat is a hero). We first meet Mary Pat in the '50s as an excited young candidate for this exciting job seeing the world. 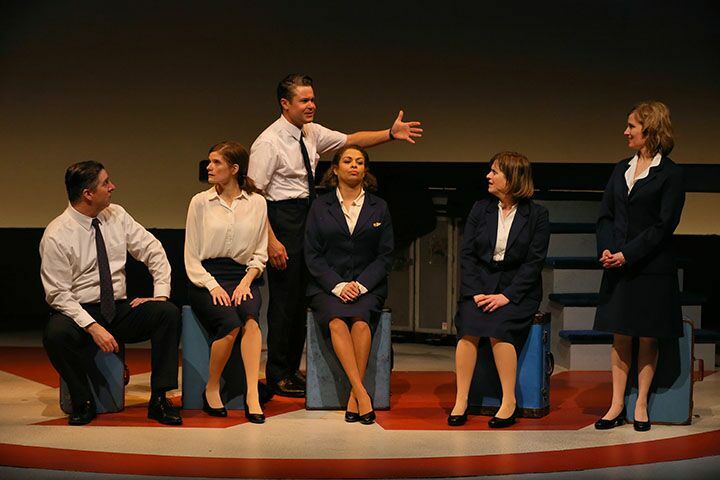 She meets fellow flight attendants Primmie, Fran, and others, as they support each other and commiserate. For once she got past the glamour and excitement, Mary Pat began to see the unfairness of a system that requires weight and grooming checks of the female employees only, doesn't allow married women or women with glasses to hold these jobs, and pays the male pursers (supervisors) more while not allowing women to even apply for the job. Mary Pat began working with the union to negotiate more fair practices, but when she was finally hired as a purser, then paid less and given lower seniority despite her experience, she became the lead plaintiff in a class action law suit against Northwest. The play takes us through the highs and lows of her journey, with people who supported her and many who didn't. There are a lot of characters in this play but only six actors, which creates a real ensemble feeling in the show. But Tracey Maloney only plays one character, Mary Pat, portraying both her strength and her uncertainty, making her very human and relatable. 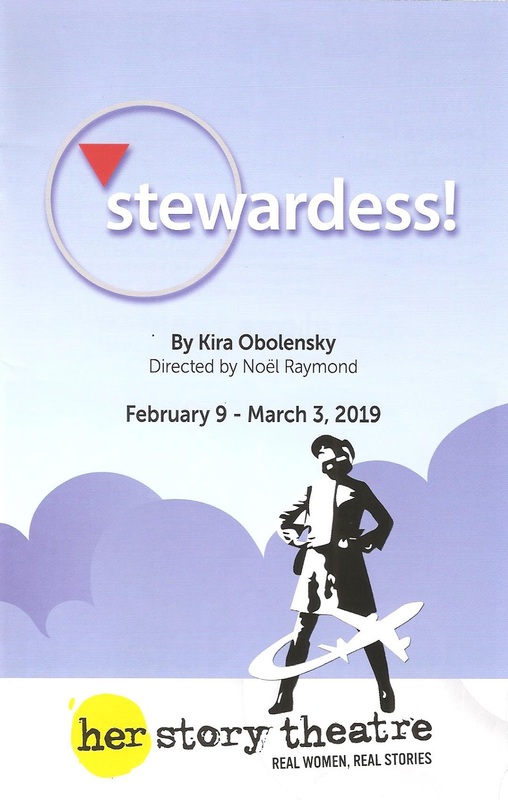 Jamila Anderson, Kimberly Rose Richardson, and Elise Langer are all delightful in their portrayal of several very different women - flight attendants, feminists, and more. John Catron and Adam Whisner have the thankless job of playing all of the jerks Mary Pat encounters on her path - and there are a lot of jerks in the story. But they commit to it (boos and all), and do get to play one or two nice guys. It's a really great ensemble, playing both the humor and the drama of the story. Director Noël Raymond balances the tone nicely, as well as the journey through time and space in this epic story. Stewardess! 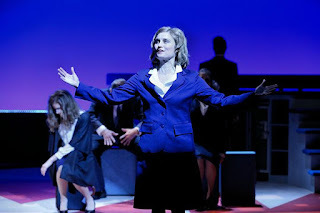 continues through March 3 at the Herstory Theater in downtown St. Paul. Don't miss this flight!